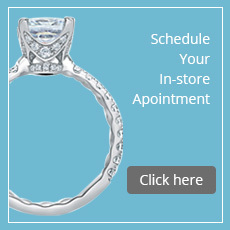 In our diamond inventory, you can buy an extraordinary selection of diamonds at amazing prices in Yakima! With thousands of diamonds available, we definitely have the diamond you need! A diamond’s weight is measured in what is known as a “carat” which is a small unit of measurement equal to 200 milligrams. Carat is not a measure of a diamond’s size, but rather a measure of a diamond’s weight. One carat can also be divided into 100 points. A .75 carat diamond is the same as 75 points or 3/4 carat diamond. Because larger diamonds are found less frequently in nature, they are more valuable. Therefore, a 1-carat diamond will cost more than twice a 1/2 carat diamond, assuming other characteristics are similar. While buying a diamond in Yakima, the most important thing to remember when it comes to a diamond’s carat weight is that it is not the only factor that determines a diamond’s value. 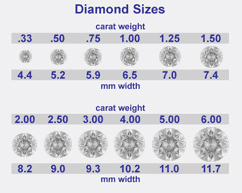 The diagram to the right shows the size of various carat weights of a diamond in relation to each other. Clarity refers to the presence of inclusions in a diamond. Inclusions are natural identifying characteristics such as minerals or fractures that appear while diamonds are being formed. They may look like tiny crystals, clouds or feathers. Inclusions are usually viewed at 10x magnification. The position of inclusions can greatly affect the value of a diamond. Some inclusions can be hidden by a mounting, thus having little effect on the beauty of a diamond. Inclusion in the middle or top of a diamond could impact the dispersion of light, making the diamond less brilliant. Inclusions are ranked on a scale of perfection known as the clarity scale. The scale ranges from F (Flawless) to I (Included) and is based on the visibility of inclusions at 10X magnification. Color refers to the degree to which a diamond is colorless. The farther from colorless that a diamond’s grade is, the less rare and therefore less valuable it is. At the diamond store in Yakima, diamonds are graded on a color scale established by the Gemological Institute of America (GIA), which ranges from D (Colorless) to Z. Icy winter whites (D-I) look stunning in white gold or platinum. Warmer colored diamonds (J-Z) are more desirable when set in yellow gold. Color differences can be very subtle, and grading is done under controlled lighting and compared against a “master” for accuracy. This color chart is representative of the color grades of a diamond. Cut refers to the angles and proportions of a diamond. The cut of a diamond refers to the exact proportions, quality of polish and the arrangement of a diamond’s facets. While nature determines a diamond’s clarity, carat weight, and color, the hand of a master craftsman is necessary to release the diamonds’ fire and sparkle. Diamond has facets that allow light to enter it, become refracted, and exit in a rainbow of colors. 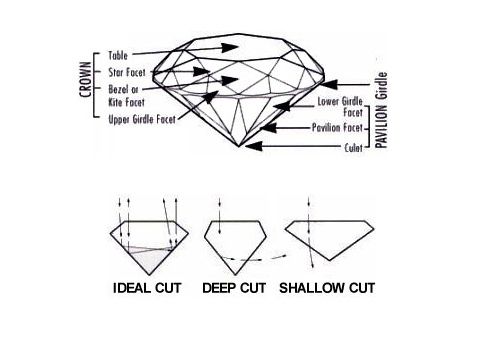 As illustrated below, when a diamond is cut to ideal proportions, is carefully polished and has exact symmetry, the light will then reflect from one facet to another and disperse through the top of the stone, resulting in a display of brilliance and fire. Diamonds that are cut too deep or too shallow lose or leak light through the side or bottom, resulting in less brilliance, fire, scintillation, and value. While buying a diamond in Yakima, the cut can affect the value of a diamond by up to 35%!